Visual Studio 2012 allows the font and colour selections to be modified at a fine level of detail to achieve the developer's personal preferences. It also adds the concept of colour themes, which change the entire set of colours with a single setting. When Visual Studio 2012 was first released, the changes to the colour scheme, font usage and other user interface elements sparked some controversy. Some developers liked the new styles, which were designed to allow you to concentrate on your code rather than the development environment. Other users disliked the new colours and other changes, such as the capitalisation of the menus, that mimic the Windows 8 modern user interface. The standard colour scheme for Visual Studio 2012 is known as the light theme. The scheme makes little use of colour, preferring pale backgrounds with darker text to allow source code to be read easily. The image below shows a sample of the light theme. As with previous versions of Visual Studio, you can change the standard colours and fonts if they are not to your taste. 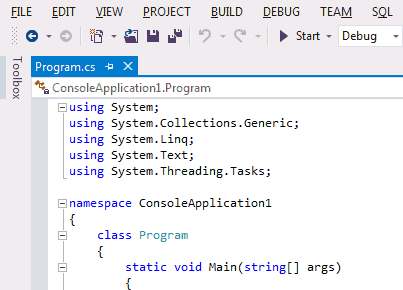 In addition, Visual Studio 2012 introduces the concept of colour themes. With themes, you can change all of the colours of the integrated development environment by modifying a single setting. Three themes are provided as standard. In addition to the light theme mentioned above, you can also select the dark theme or the blue theme. The dark theme uses a dark background with lighter text, lines and filled areas. Some developers find this theme to be more comfortable, possibly leading to less frequent eye strain. 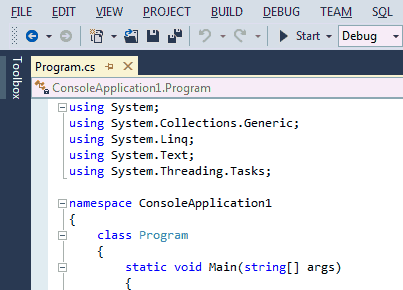 The blue theme is similar to the colour scheme provided by Visual Studio 2010. The image above shows an example of the dark theme. The following screen shot was produced using the blue theme. You can select a new theme from using the Options dialog box. Open the Tools menu and select Options to show the dialog. Expand the Environment section in the tree view to the left and select General. The right side of the dialog box shows the Color Theme drop-down list, from where you can select your preferred style. If you don't like any of the standard themes, you can find many custom themes on developer web sites. There are also tools available that allow you to quickly build your own theme. 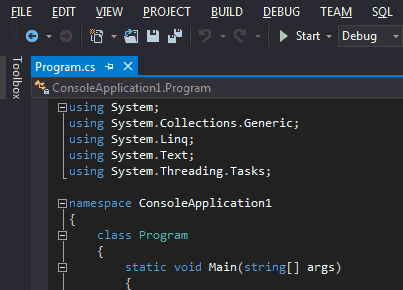 One example is the Visual Studio 2012 Color Theme Editor extension, which also adds several additional themes to the Color Theme drop-down list.